Bobbins are the main tools of a lace maker. 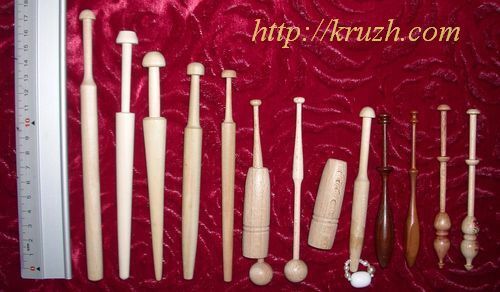 Variety of bobbin sizes and forms (Fig.1.16) depends on local traditions of lace making. Original bobbin forms were created for many dozens of years. Lace bobbins are always available at cottage industry. The workshop manager has possibility to order a large party of bobbins . As to individual Russian lace makers working at home it is a problem for them to buy bobbins at retail trade. However there are appropriate suggestions for the World Wide Web users. Besides bobbins, a lace maker needs a tool kit. 1. 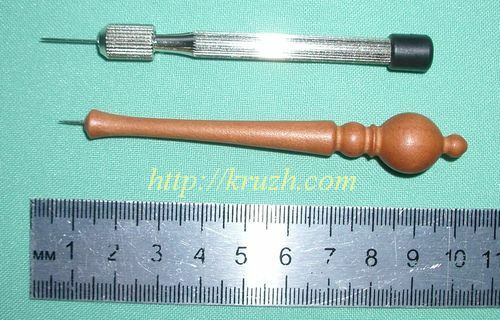 A crochet hook (Fig.1.17) is necessary for link lace plating. A hook size depends on thread thickness. For instance linking of twin threads is better to make with a hook № 0.5 or № 0.55. More skilfull work is to be made with a hook № 0.4. For threads named “Snowflake”, “Lily”, “Rose” a hook № 0.6 is to be used. 2. Embroidery scissors are necessary to cut threads (Fig.1.17). 3. A thin pricker (an awl) is used often (Fig.1.18). Sometimes a pushed pin rests against an obstacle such as an wood chip when the bolster is filled with sawdust. In this case you are to stop pushing a pin to escape bending it and injuring your fingers. The same can happen when the bolster is made of dense plastic. In similar cases all points of the lace pattern are to be pricked previously with an awl. At the 19th century a pricker was used to copy plated lace on a cardboard as well to make many copies of a lace pattern. The lace was plated from point to point without drawing pattern lines. 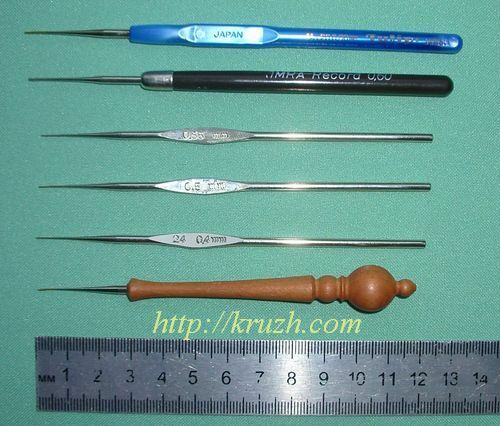 If a handy pricker is not available in retail trade you can do it easily of thick needle and a wood stick. The stick is to be boiled previously in water for 10 minutes. Then the blunt end of the needle is to be pressed into the wood handle (Fig.1.19). 4. Pins are the mass tool of a lace maker. Long and short pins made of steel or brass have a spherical head (metallic or plastic). Before plating several dozens of pins are placed on the bolster and on a small pincushion. The rest pins sorted by size and thicness are saved in the special boxes (Fig.1.20). Sometimes pins falls out of hands and out of the bolster. They can be found easily on the floor or on the carpet using a permament magnet (Fig.1.21). It very important tool for safety work. 5. 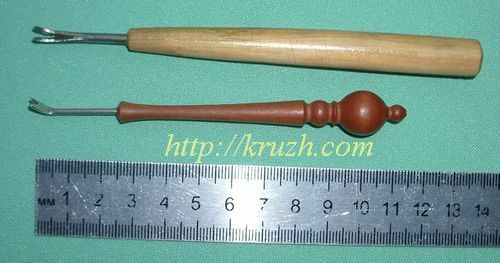 West European and North American lace makers use auxiliary instruments: pin pusher, pin-lifter and pusher-lifter. “Lazy maid” is used for thread linking in places that are difficult to access. 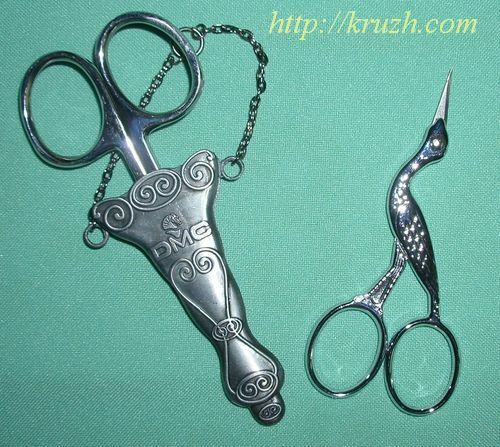 The mentioned above tools can be bought apart or as a complete set with scissors and pincers. 6. 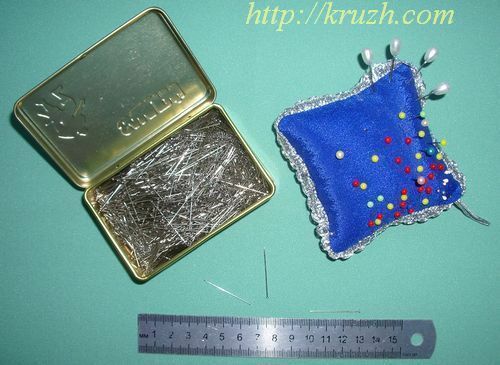 A clutches for reserved lace bobbins are very useful contrivances. A lace maker can make a simple rubber clamp. It needs a piece of a school wood ruler and a rubber ring used to tighten a batch of bank-notes. Two slits for rubber ring are to be made at the ends of the ruler (Fig1.23). A clutch holds lace bobbins and prevents threads become entangled during travel with the bolster or for a long interruption of plating. Bobbin clutches are necessary in multi-twin lace technique on mushrooms pillows. The same purpose sometimes is achieved by means a great number of napkins used to interlay bobbins. Lace making becomes more perfect when it is provided with technical contrivances including a rest for a pillow, a bobbin winder and other equipment. However these are too complex to be done by a man who never worked with a drill, a hack-saw and a file. Theoretically one must be a certificated designer, a mechanical engineer and at the same time a tuner, a joiner, a metalworker, a fitter and so on to create new equipment for bobbin lace making. Of course, it would be good to have such splendid professions, but domestic skilled craftsmen quite often disprove this theory. Some of them can invent and make very useful tool for lace maker disposing of limited resources, with restricted tool set and materials. First of all one must have an unbreakable wish to solve a technical task. Besides it is useful to study all former attempts to solve the same task. Personal experience is needed as well. At last a paradox is that some people can find an original decision in spite of generally accepted idea that the task can not be solved at all.